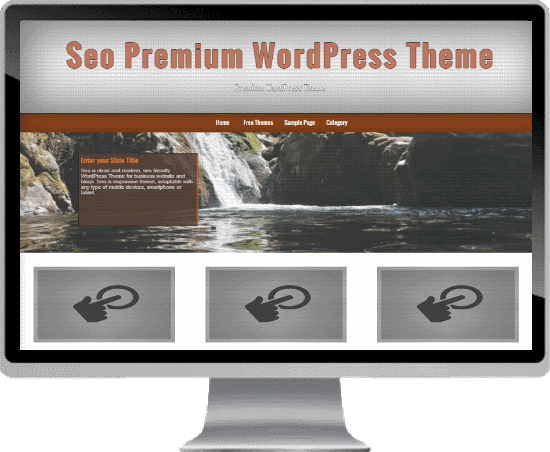 WordPress SEO Theme. SEO is clean and modern, SEO friendly Multipurpose WordPress Theme for business website and blogs. SEO is responsive theme, adaptable with any type of mobile devices, smartphone or tablet. The theme offers Widgetized Sidebar, Custom Post Types, Customize – Home Page Canonical URL, Custom Background Support, Custom Menu, Custom Colors, Dynamic Widgets, Home page Slide ( Responsive and Mobile Touch Friendly ), Shortcut Icon, Google Verification Code, Home Page Featured. To learn more about the theme please see below. Compatible Browsers IE9, IE10, IE11, Firefox, Safari, Opera, Chrome. Revolution Slider – 5.2.2 – Worth $19 you get it FREE. Simply the best slider. WooCommerce Support – It allows you to create a shop. Animations Menu – 48 animation effects and animation speed option. – In your admin panel, go to Appearance -> Theme Options. 687 Google Fonts – In your admin panel, go to Appearance -> Theme Options. Contact Form – Go to your admin panel. Social icon buttons – Facebook, Twitter, Linkedin, RSS, Pinterest Youtube, Vimeo, Google+. – In your admin panel, go to Appearance -> Customize. Scroll Effect: – In your admin panel, go to Appearance -> Theme Options. 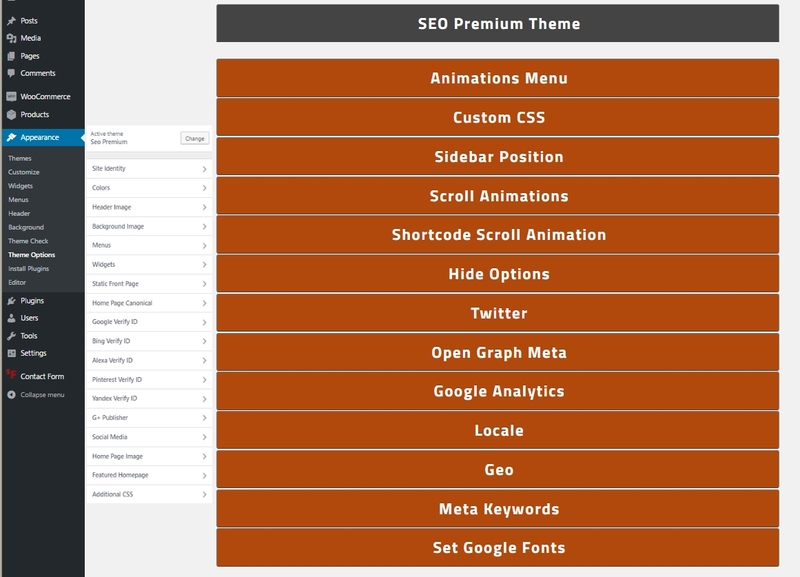 Hide Featured Homepage: – In your admin panel, go to Appearance -> Theme Options. Hide Slide Homepage: – In your admin panel, go to Appearance -> Theme Options. Hide Back to top button: – In your admin panel, go to Appearance -> Theme Options. Custom CSS: – In your admin panel, go to Appearance -> Theme Options. Sidebar Position: – In your admin panel, go to Appearance -> Theme Options. Twitter Card: – The type of card to be created: summary, photo, or video. In your admin panel, go to Appearance -> Theme Options. Bing Verify ID: – In your admin panel, go to Appearance -> Customize. Alexa Verify ID: – In your admin panel, go to Appearance -> Customize. Pinterest Verify ID: – In your admin panel, go to Appearance -> Customize. Yandex verify ID: – In your admin panel, go to Appearance -> Customize. URL publisher: – In your admin panel, go to Appearance -> Customize. Header Image – In your admin panel, go to Appearance -> Customize. Background Image – In your admin panel, go to Appearance -> Customize. Custom Background Color – In your admin panel, go to Appearance -> Customize. Custom Header Color – In your admin panel, go to Appearance -> Customize. Icon Option – Shortcut icon options allow you to post url shortcut icon. – In your admin panel, go to Appearance -> Customize. Homepage Slide option – Add img, url and content. In your admin panel, go to Appearance -> Customize. Homepage Canonical URL – Add your canonical url. In your admin panel, go to Appearance -> Customize. Google verification code – Add your google verification code. In your admin panel, go to Appearance -> Customize. Homepage Featured – Three homepage featured images. In your admin panel, go to Appearance -> Customize. Widgets – Custom widgets – aside and footer. In your admin panel, go to Appearance -> Widgets. Font Awesome – The complete set of 605 icons in Font Awesome. Back to top – Back to top button. 2. Click Upload and Choose File, then select the theme’s ZIP file. Click Install Now. 1.How do I change the color scheme? 2.How do you set up the slideshow? 3.How to Install WordPress Theme?